Today's post is admittedly kind of a silly one. But a few days ago, as I sat cross legged on the floor resting a bowl of black olives on my belly bump that I devoured in a matter of seconds, I had this idea that it would be fun to share my random pregnancy cravings with you guys. If my pregnancy brain is living in full time crazy town right now and you find this post absolutely ridiculous, feel free to close the page and come back tomorrow for our regularly scheduled lifestyle and design posting. If you'd like to learn more about my nonsensical food cravings while with child, however, read on my friends. I think the main thing that prompted me to want to write about this was the fact that food cravings during pregnancy are just so, well, mysterious. Yes, scientists do have some varied explanations for why we crave what we do, but they still can't quite pinpoint why pregnancy cravings are so odd and so specific. Some believe that they represent what our bodies need at any given time - but others say that if this is true, we would all want to shove kale and raw broccoli down our throats instead of mint chocolate chip ice cream and Fritos (two of my current faves). I just don't know a ton of pregnant ladies who tell me that they'd gladly turn down a double bacon cheeseburger for a bowl of quinoa when their body needs protein. So yeah, it doesn't completely add up. The only certain reasoning science has is that it's likely hormones cause it - but how and why is still to be determined. The other strange part of pregnancy cravings is that they are often for foods we normally have no great desire to eat (again, back to the Fritos for me), and they are intense man. You don't say to yourself, "a Take 5 candy bar would be so good right now" at 2 AM and then fade back to sleep. You get out of bed and into the car, pajamas and all, and you drive to whatever store is open 24 hours to get one. And cravings can vary from pregnancy to pregnancy too. Although many of mine have been the same for both, there are a few items that have been specific to each one. With Essley all I wanted was a damn margarita (a million thank you's to my friend Cara who brought me all the fixins for one in my hospital room literally the day after Essley was born) along with english muffins drenched in butter, orange Fanta, and tangerines. Those haven't been at the top of my list this time around. (I do crave a nice alcohol beverage again, but this time it's beer. Oh how I will lovingly slam that first ice cold Corona with a big ol' lime.) It's pretty nutty. All of it. I'm usually a fairly healthy eater. As my regular readers know, I'm a long-time vegetarian, and I eat a lot of plant based proteins. I drink green smoothies everyday (although just the thought of them sent me into audible gagging spells in my first trimester, so I had to take a couple month break). I eat a lot of beans and nuts and chia seeds and raw veggies and leafy greens. 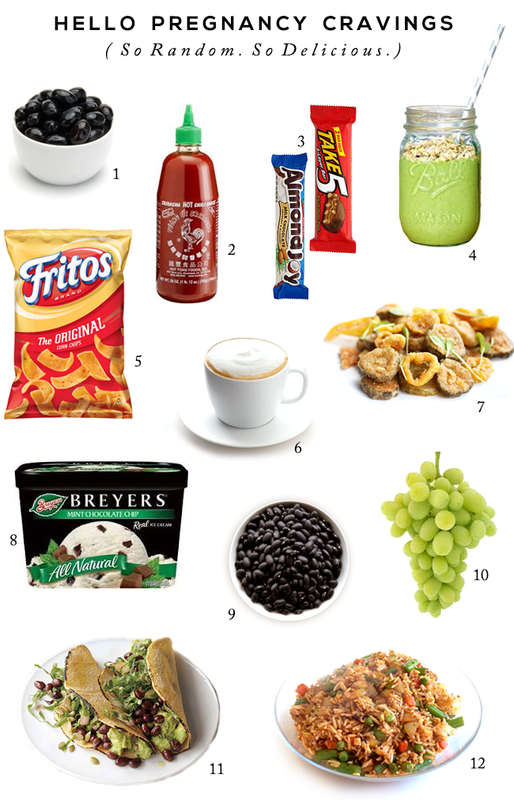 But as you can see from the hilariously ridiculous food collage I put together above, many of my pregnancy cravings do not include what one would normally describe as healthy eating choices. I'm not eating this stuff all day long or even everyday though. There is, after all, a little human inside of my uterus right now who deserves to get all of the nutrients he needs. But I'll be honest guys - when a craving strikes, I am not afraid to act on it, health food or junk food. From Sriracha on everything (seriously, my husband tells me he's just going to open the bottle of it and give me a straw) to Almond Joys to veggie fried rice with extra egg to allll the black olives, I know what I want, and I usually act on it. I am powerless to the cravings. What else can I say? Okay pregnant pals and ladies who have been pregnant in the past, spill it. I told you about my weird cravings (and even made a handy collage of pictures of them), and now you have to tell me yours. Haven't been pregnant? Share the cravings of friends or family members. Ready, set, go! I love this post! I craved Fritos too, so funny. And also mint chip ice cream! My other big craving was cheeseburgers, like so bad. I wish I could say I wanted healthier foods but I just didn't. I wouldn't say i had any weird cravings, but the things I liked before I REALLY like now and they seem to taste better, specifically nacho cheese Doritos and chewy chocolate chip granola bars. This kid better like peanut butter and cheese too because that's all I never eat now. Omg I love fried pickles, even though I'm not pregnant lol!!! My sister craved cheese and bacon omelettes for like every meal. Take Fives are the BEST CANDY BARS EVER! I feel like when or if I ever get pregnant I will be eating them nonstop, haha. My best friend ate olives all the time was she was pregnant too. Agreed! It's not even right how delicious they are. Mmmm....black olives and Take 5s...Yes Please!! Mine was pretzels and chocolate covered bananas! So weird! Never heard of fried pickles, I'm very curious! I LOVE your blog! I am a new mom (one son and another to arrive in december!) This blog is fabulous and I will DEF be following!